Discussion in 'Land of the Rising Sun: ADV Bikes from Japan' started by Doug Matson, Nov 11, 2003. Speed Channel "Two Wheel Tuesday" is doing a bit on the KTM team tonight, now as I type. It was good coverage. They split it up into two sections in the Two Wheel Tuesday show. KTM hired Jimmy Lewis to teach these guys navigation skills and other details they may need to know while out in the middle of no where. The US team is going to race the Baja 1000 for practice time on the bikes this month. They did not say which bikes they would be running in that. But they were for sure testing the 950 rally bikes and the 660 as well in the story. Wish I had taped it now. Does anyone know for sure that SpeedChannel will be covering the race? I'd have to upgrade my cable to get SpeedChannel and I don't want to pay to upgrade if they aren't going to be showing it. I've checked their website and couldn't find anything. Greg (Greg's Garage) did say that SPEED would be covering it. Of course it will take second stage to the damn NASCAR crap. So that means we will have to watch it at 2:00am or set our VCR/TIVO. They had a great DAKAR wrap up show last year on SPEED. It lasted about 2 hours and covered all the vehicle divisions. Let's just hope that the coverage they have will be good for the 2004 race. Last year, they had pretty good coverage, with a one-hour show to kick it off, a half hour show every night at 7pm, then the hour (or two?) long wrap-up at the end. I hope they will do the same this year. Are you hiring him out for stud? It would be kinda funny to see a bunch of babies born over the next year with sideburns. They've been doing that coverage for years now. I look forward to it every year. The "stupid git" that commentates is a little annoying- but the footage they get is incredible~ Usually starts the night after the race begins with the nightly deal that Dukegirl mentioned. Can't wait!!! Did anyone see the piece last night about the Harley V-Rod sidecar prepping for the Dakar? Pretty cool ride- DNF bound!!! How much do you think I could get for him? I have all of last years' shows on tape. I may have to drag them out and watch them before this year's race. Did anyone see the piece last night about the Harley V-Rod sidecar prepping for the Dakar? Pretty cool ride- DNF bound!!! Yeah, that thing is nuts! I would love to see them get the funding to get in the race. They need $35k by this Saturday. It's great to have TiVo. I haven't deleted it yet either. Good to see Jimmy Lewis on the Dakar piece. I saw the V-Rod outfit at Laguna Seca this past Summer. Nice guy - hope he finds sponsorship. Thanks for the kind words about me. I had a great time at Laguna, and all you guys were friendly and enthusiastic. 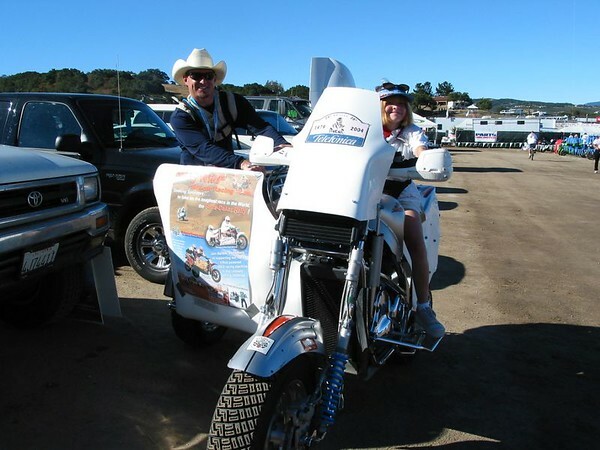 My web site has the video from the 2-Wheel Tuesday show, but I cut it down to only my sidecar stuff. Still really cool though! I also captured ALL the KTM/RedBull stuff from the show and have it as MPEG. Non-believers like Jabba don't get it though! If I don't get the funding this year, I'll be there for sure next year on my own wallet ($75,000). If it was easy, I wouldn't do it. And if I had an attitude like Jabba, I'd sit at home with a TV remote and eat Pizza all weekend! you are Absolute Inspiration,,at least to me,in many way than one. I hope you find the found,to be able to follow your dream. I have the older model TiVo that will record to video tape. The new ones record to DVD or send over the internet. $$$$ but very cool. I'll transfer the show to tape for you. Scott great piece on your bike, I hope you get your funding, I will be rooting you on and praying for you safety.